Talking about music – here is my fresh selection of December favorites. As always – eclecticism is the name of the game. Starting with the very funky and groovy „Tribute to JB Family“ by The Last Minister, which was released on the Italian label Irma Records back in 1992 - which makes me wonder how I could have missed this song for so long! Well prepare yourself for 6:19 minute long tour de funk with a bit of a dirty house touch. The next song - keeps the groove - but gets a little more soulful with a nice version of „Going back to my Roots“ by Odyssey. Two other versions of this song I like are Richie Havens cover - and the original by Lamont Dozier. The 3rd song almost gets a little cheesy, having a strong 80ies Jazz feeling – but somehow I dig it! And with a song versioning Dave Brubeck's „Take 5“ one usually can't go too wrong. Track #7 is a very nice edit by Mr Daytoner from Cornwall, England of Marcia Griffiths „Feel Like Jumping“ - if you ask me – pure dancefloor gold! This is what Mr Daytoner had to say about this edit: „...We'll take you back to the very beginning' - this is the first edit I ever made for DJ sets (a few years ago now) - a basic edit of Marcia Griffiths classic from 1968 with just a break & a couple of samples extended over the fade to ensure regular use in sets (also used it for the opening track on the Daytoner Radio Debut mix)“. Track #9 is a great deep discoish cover of „Sunny“ by the mysterious DJ and producer „The Legendary 1979 Orchestra“ from Romania. The song „Sunny“, originally sung and written by Bobby Hebb in 1963 (and its countless versions) has always been a favorite of mine. That song even got me a date! Some 10 years ago, while I was working in a second-hand book and record shop in Germany, I remember one day a nice lady was entering the shop, catching my attention. And the minute I played that song she gave me a sweet smile. La Playa Sextet - Pachanga Con La Playa (Hobo D Reedit) - track #15 is a bouncing cumbiaish reedit by Hobo D. Really nice. But unfortunately he hasn't been updating his soundcloud page for ages. Hopefully he reads my blog and shares some more edits soon :) I'm ending this compilation with some Indian and Balkan sounds: Track # 17, which is „Sote Sote“ by The Bombay Royale – a fast drivin' funky rocky something song with some crazy crazy crazy Moog like only dem Indians can play it ;-) Track #18 is called „Balkan Banghra“ by Volfoniq - and it definitely got fire! Nice song mixing Balkan elements with Indian Banghra and some dirty electronics! Check out Volfoniq and the rest of the album „Ernest“– which they kindly share for free on their website. 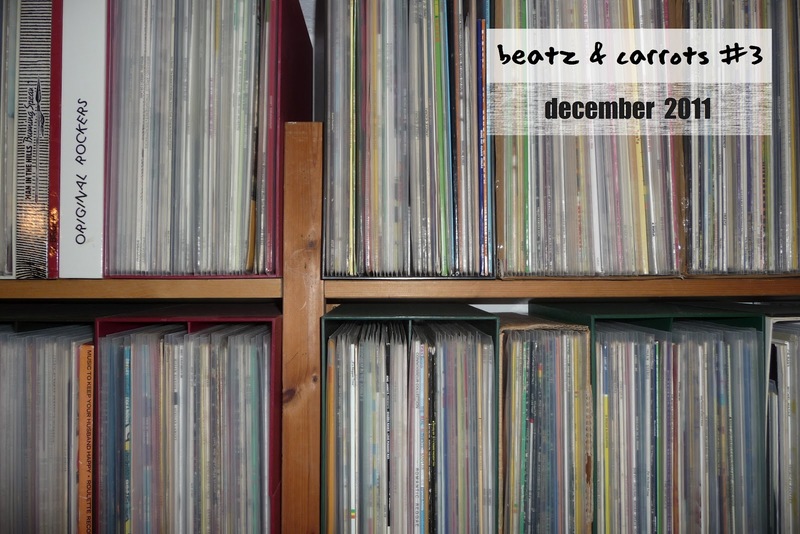 Beatz & Carrots #3 - still going strong! Nice comment, thanks ;-) I am sure my parents like my blog... at least they always ask for new mixtapes once in a while... Looking forward to hear your latest ~ a month in tunes ~ selections! Very much looking forward to reading through and listening to the treasures that i'm sure are in here. If only it was up and running when we were playing many a late-night in the Reggae Bar, Chengdu! Alas, much preferred sharing a white russian and discussing/listening to the new treats face-to-face. Welcome back! Hi, thanks for the kind words, it's a pleasure for me to discover your blog. Feel free to drop me some word via the contact form on my website, i'd be happy to share with you !